The simple fact of the matter is this: No One Knows. In 2006 Knoebels Amusement Resort began building one of the most enthusiastic and anticipated roller coasters to date, giving it the name "Flying Turns". 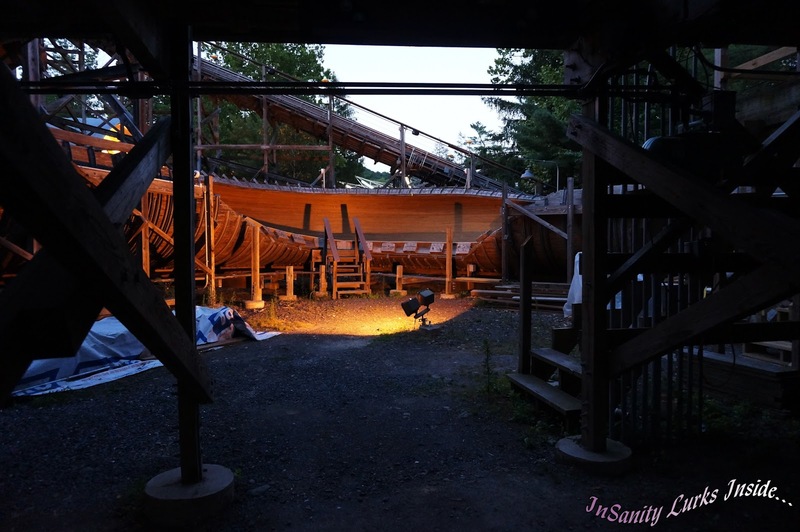 To understand, Flying Turns is style of roller coaster, a bobsled but made entirely of wood. One hasn't been built since 1940 and currently there are no operating wooden coasters of this style left in the world. So you can imagine the hype that Knoebels got when they announced they planned to build an antique coaster in this style. The problem is this, no one alive today has knowledge of how to build this ride. Only the plans which are from a ride designed by John Miller and John Bartlett from the 1920's. Now, Bobsled style coasters do exist today only the ones that still operate are made entirely of steel and most were built in the 1980s. Those are even beginning to become rare as they are replaced with other, more modern attractions. I find this to be a shame because unless you've ridden one you can't understand how fun they really are. Bobsled coasters don't run on a "track" per say, they move freely on a curved "bobsled" track except for the lift hills and brake areas. They are simple, efficient and fun as hell. Now, back to the history of Flying Turns and it's current status.. In 2007, I don't think any of us were truly surprised when the ride didn't open as planned. It was plagued with problems from the moment it began testing. The first problems found in the 2007 testing was the coaster wheels, which got replaced and delayed the opening. By 2008 this was still an issue as the coaster train was still traveling too fast for rider comfort, delaying opening till 2009. 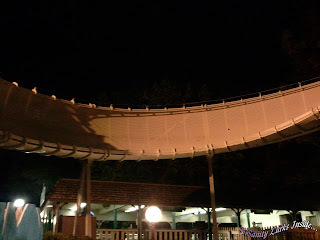 In 2009 they still had an issue, the ride was completely re-tracked as well as Knoebels ordering entirely new ride cars for the coaster, delaying again until 2010. In the 2010 season it was still having issues, now 4 years behind plan, all the issues this season revolved around not being able to get things running properly. By 2012 things still aren't working out, parts of the ride were completely re-designed to fit the new ride cars including the brake run, the second lift hill and the new trains are finally delivered. Testing began again on Flying Turns with the ever optimistic park saying that this year would be the one it finally opened. 2012 ended without the opening of Flying Turns, by this point a lot of fans began the waiting game for yet another season. At the opening of the 2013 season the hype began again, Knoebels said that THIS would be the year it opens. Surely they couldn't be wrong again? Well, so far Flying Turns has not opened. However, they have been testing in recent weeks. 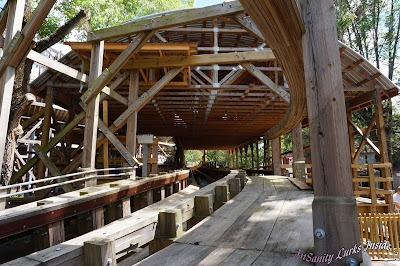 People have seen the trains run through the coaster, which is a decided improved over several seasons of nothing at all. The downside to this is that I've heard several rumors from people close to the information sources which tell me things don't look great for 2013. 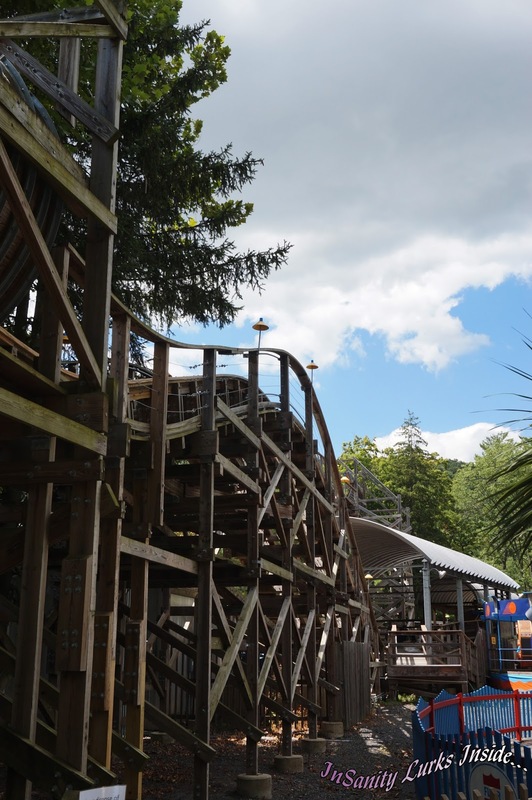 It's once again had problems, they didn't fully disclose the nature of the 'problems' but said that some of the Knoebels grandchildren rode it several days before our visit and it encountered some kind of 'large problem' and was immediately shut down again. Now, I can't tell you if this was a technical problem or some form of an accident. That much wasn't disclosed, only that it had once again been shut down. To my knowledge, another train hasn't run on the ride since that event about 4 days before our visit on July 24th. Once again, the ride is Standing But Not Operating (SBNO). We don't know. No one but the builders and the Knoebels Family know and they certainly aren't talking about it to anyone. Now, I understand problems would happen trying to build a ride that hasn't been tried since the 1940's and that they obviously didn't understand the undertaking they assumed nor the many, many problems they would encounter. However, they have kept at it for seven years which deserves some heavy duty credit. Whether this is a matter of pride, money already invested or just plan determination.. I can't say. 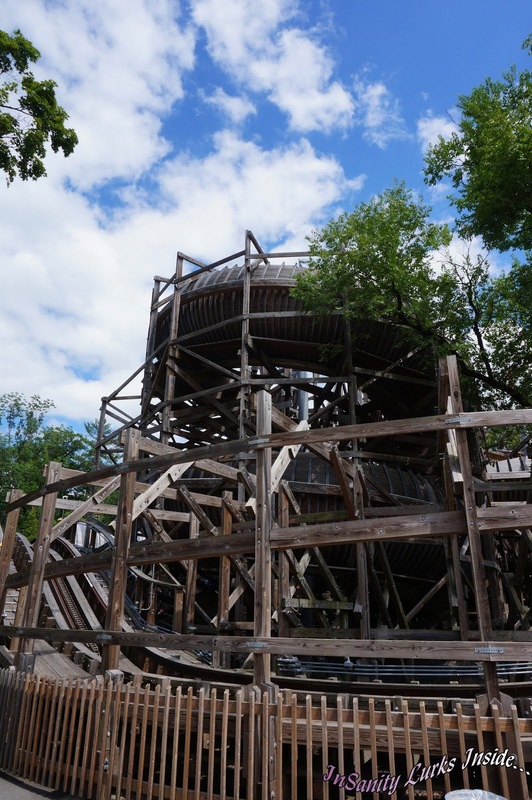 Some are calling it the "Lawn Ornament" (a common name for an SBNO coaster) while others have nicknamed Flying Turns "The Money Pit" and "Knoebels Folly". All I can personally tell you is the ride looks amazing. I stood at the gate for a solid ten minutes and made "grabby hands" at the ride, muttering "I want it, I want it now.. gimmie gimmie gimmie" along with something close to 'I don't care if it kills me, just let me on it'. 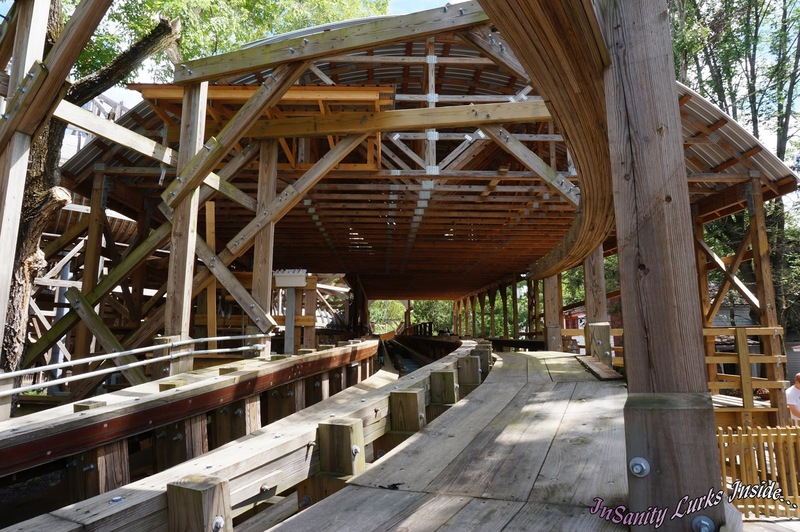 It just looks amazing, it's a twisted mass of curved lumber so dense you can't fully follow the ride path. This is something out of history that has come to partial life and taunts us riders with it's uniqueness. We all want it, we wanted it seven damn years ago and we still want it today. I can't tell you when Flying Turns will open. I can't even tell you if it's still testing at this point. All I can tell you is that the few employees who would speak to me about the ride don't anticipate it to open for the 2013 season. So we wait, yet another year, we wait. I'm fairly sure some of us are beginning to develop a nervous twitch anytime someone mentions "Flying Turns" out of waiting so long. I know that good things come to those who wait and that patience is a virtue but neither of these are something I've ever personally been very good at! 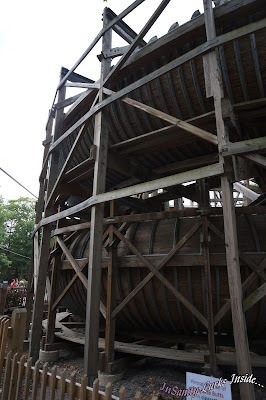 My one concern is that by the time they eventually get this ride operating, a lot of the wood may need replacing. Pennsylvania mountain winters aren't easy on wood, more so on wood that isn't being used. 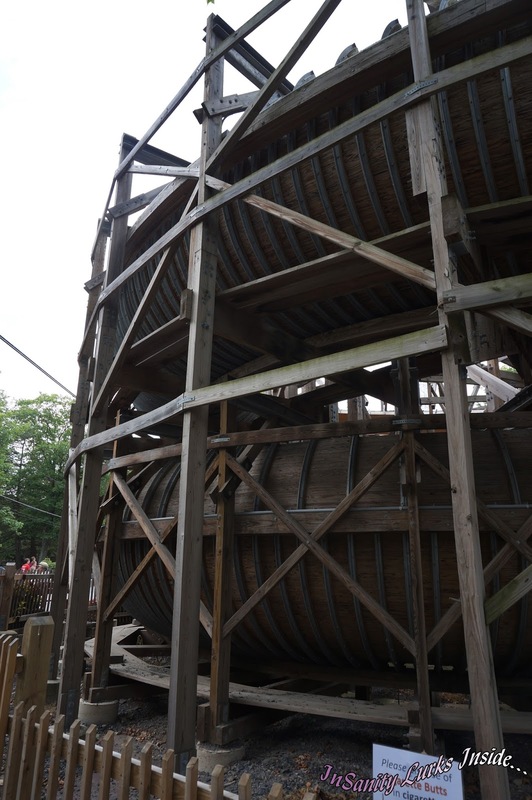 Already, you can see new planks on the ride that have been replaced as well as see the obvious weathering which has happened. 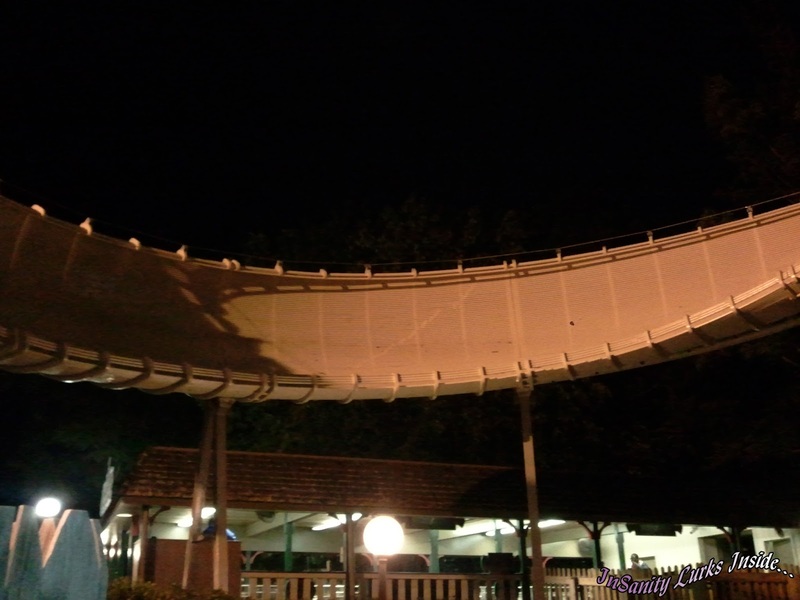 Without even being open, Flying Turns has become a true roller coaster to the fans. It's an emotional roller coaster we all ride every season, in turn hoping it opens but trying not to hope too much so we aren't entirely disappointed. Either way, I hope you've enjoyed the pictures and the information I've been able to unearth about the ride even if some are rumors. Whenever Flying Turns does open, I can promise one thing. It will be covered here at InSanity lurks Inside. 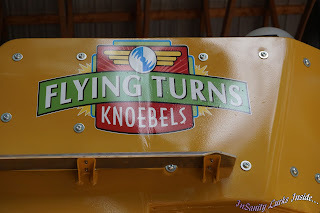 Because the moment I hear that this coaster is open and operating, I will be dropping everything and will be speeding towards Knoebels before anyone knows what happened. Until then, like the rest of you, I wait. 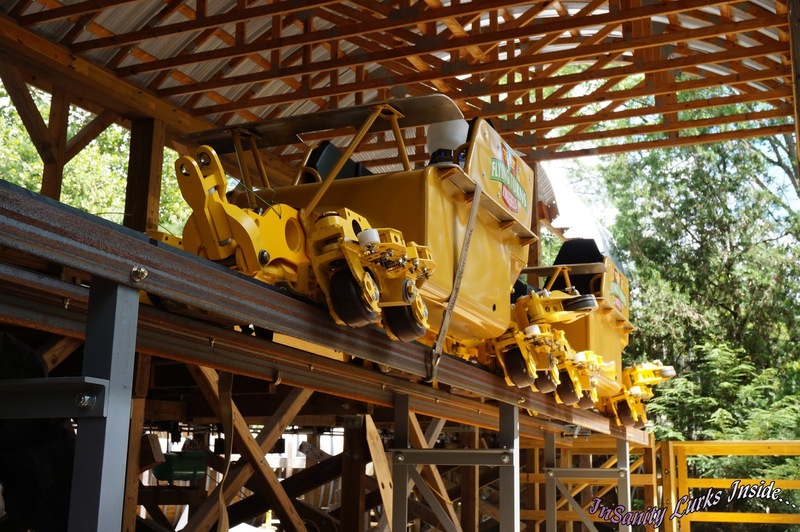 We've got a new rumor about Flying Turns and the fact it just might open for the 2013 season! Check the newest blog post for the information! Flying Turns Status Update- Possible Labor Day Weekend Opening? !